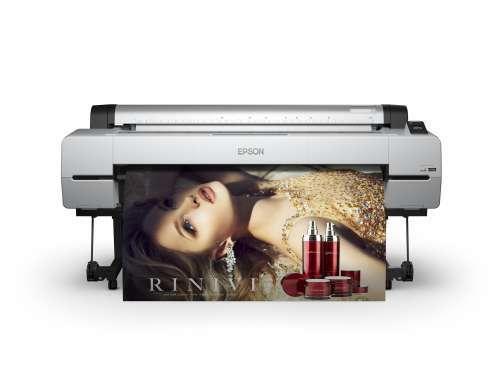 The Epson SureColor SC-P20000 is designed for high productivity with superior quality printing on a range of substrates. Using the Epson PrecisionCore Micro TFP printhead the Epson SureColor SC-P20000 produces outstanding results, even when printing on lower quality/ draft modes. The printer also features a newly developed camera based paper feed stabiliser and media inductive roller system. The Epson SureColor SC-P20000 uses the latest ink technology from Epson, the all new Epson Ultra Chrome Pro 10-colour ink set, designed to deliver long lasting prints with fantastic quality. Producing deeper, richer blacks using high-density Photo and Matte black inks as well as vibrate colours. The new ink set has been much improved helping to reduce gradation and graininess thanks to K4 and Multi Droplet Technology. The printer comes with a newly designed LED control panel which gives clear instructions and helps guide the user through its interface and working with the printer. Everything from basic printer handling to media unloading/ switching is simple and easy to do. The Epson SureColor SC-P20000 also come with a newly developed transparent covers so users can easily preview prints as the printer is printing and determine the amount of media left. Maintenance costs can be kept low using the printhead positioning technology, allowing the operator to easily access the printheads after printing to quickly clean the heads and the ink cap.